The Uffizi evening openings are starting today: music and dance at the museum. 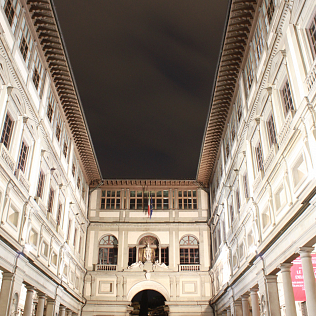 From today, June 14th, until September 27th, the Uffizi Gallery - every Tuesday - will be open until 10 pm. Visitors can admire the masterpieces of the museum in a unique and charming context but also participate in cultural events to be held in the exhibition rooms. Tonight, there will be the first event: the jazz quartet "Musicheria" and the ballet "Versiliadanza" will be the protagonists of this evening. However, there will be not only the music: the Musicheria group, in fact, will accompany some readings, taken from works by Henry James (who depicted the Uffizi in his The portrait of a Lady) and by Herman Melville. The Versiliadanza dancers will offer a performance of contemporary dance, inspired by the experience of the visitors who walk in the Gallery during their tours and on the influence that the artworks on display have on their emotions. In the coming weeks there will be other events, related to the various arts, literature and music, in close connection with the environments that host them, the exhibition halls of the Uffizi with their protagonists: the art masterpieces.